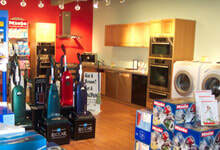 At North Shore Vacuum and Appliance, we are proud to offer Miele vacuum cleaners to Andover MA residents and businesses. We stand behind the quality of such leading brands as Miele, and work with them to offer a full-line of Miele vacuum cleaners and appliances, as well as replacement parts for our customers. We are the largest resource for Miele vacuum cleaners throughout the greater Andover region, and take pride in having the inventory our customers are looking for. Not everyone has what it takes to be a dealer for Miele vacuum cleaners. The opportunity to become a Miele Diamond Dealer is a rare, exclusive offer made to stores such as ours that are willing to push the envelope to provide continued quality service and the expert knowledge necessary to sell the product. Luckily for residents and businesses throughout Andover, MA and beyond, they can find such service here. Are you interested in learning more about Miele vacuum cleaners? Our staff is here to help. Call our shop today at (978) 774-1155 to speak to one of our knowledgeable sales members about Miele vacuum cleaners and see why Andover, MA residents choose us.